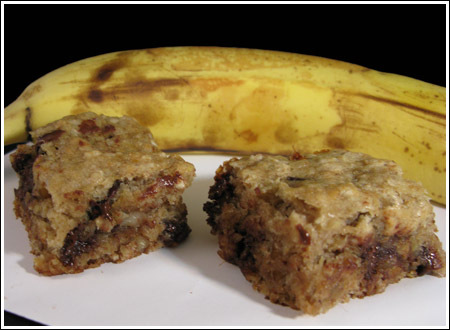 Banana Walnut Chocolate Chip Bars that can be made in the usual non-vegan way, or made vegan by using vegan chocolate chips and a mixture of flax and watear in place of egg. Preheat oven to 350 degrees F. Line an 8 inch square pan with non-stick foil or parchment. Mix together flour, salt and baking soda. In a mixing bowl, beat together butter and brown sugar. Beat in egg (or flax), bananas and vanilla. Add flour mixture to banana mixture and stir until absorbed, then stir in oats, chocolate chips and walnuts. Spread batter in the pan and bake for 25 minutes or until set. Set pan on a rack to cool, then lift from pan and cut into 16 squares or 12 bars.